I am slowly settling in again and trying to get back to my normal daily routine (why does work pile up when you go on vacation? meh) so in the meantime and while I prepare some posts that I have in mind here are a couple of manicures I did for my friend S. while on vacation. All the polishes, tools and accessories we used were purchased in Tokyo. 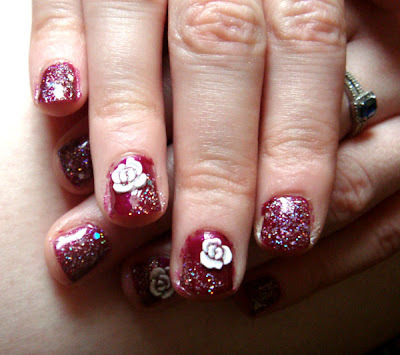 For the first look I used a pinkish red Anna Sui polish, a Kate glitter and 3D white rose stickers. Sealed everything with two coats of special Gel look top coat. For the second look I used a white Jill Stuart polish with pink shimmer and a blue glittery Anna Sui polish. The cute kitty stickers are actual stickers bought from Tokyu Hands. Everything was sealed together with Anna Sui topcoat. I have more vacation manis to share but it will have to be in another post. the roses are really 3-D, i thought they were clay! I like the roses too, they really look 3D! The roses really look amazing. I wish I had bought them in other colours too. The rose manicure is too gorgeous!! 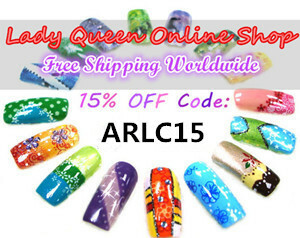 I want those rose stickers now =p I think I will have to do an inspired rose mani, I absolutely love the look of it. 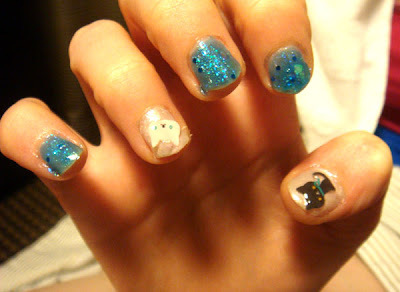 And the kitty manicure is so cute!